I have to begin honestly if I’m to continue honestly: being a World Youth Day (WYD) volunteer began to take its toll. The week before WYD began, sleeping three hours per night wasn’t so bad. Who wouldn’t want to wake up at 5:00 a.m. to interview inmates at a correctional facility the pope was to visit? Or stay up until 4:00 a.m. playing competitive dominoes with a priest, photographer and newspaper director? Or run around the steps of the Panama Canal administration building conducting impromptu interviews? Needless to say, I took advantage of these opportunities at the cost of sleep. And once the actual week of WYD began, I started to run out of steam. Pope Francis arrived in Panama City on Jan. 22, which marked the first time a pope has visited Panama in 36 years. All of Panama and the thousands of pilgrims and volunteers present in Panama City for WYD were ecstatic. Sure, I was tired, but the thing most stifling my excitement was that I thought seeing the pope would be nothing new. 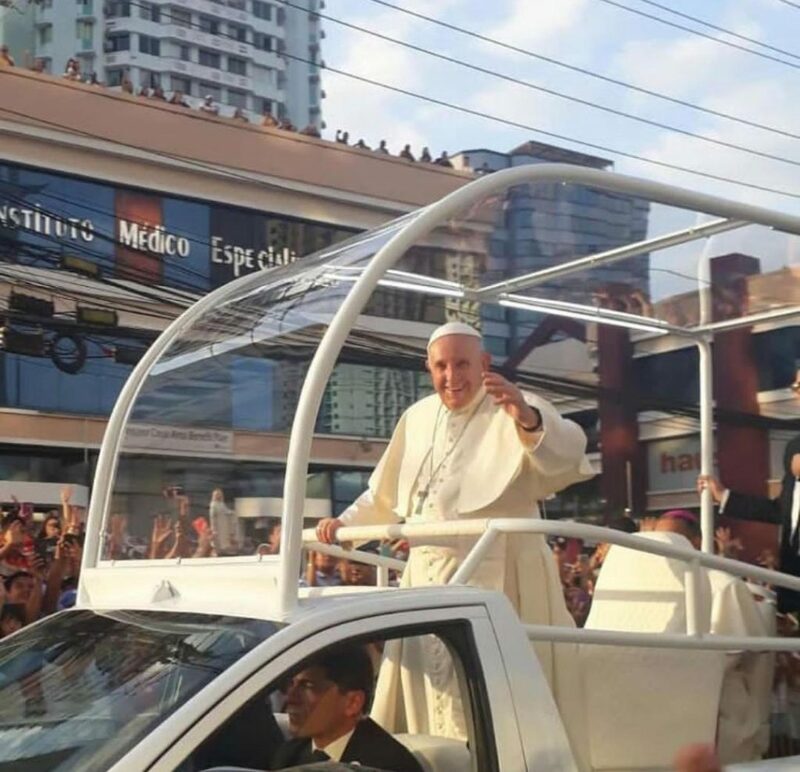 I had already been blessed enough to see Pope Francis twice and Pope Emeritus Benedict XVI before him, and the thought of braving crowds of thousands and the scorching Panamanian sun didn’t appeal to me. In short, I wasn’t excited to see Pope Francis. I know it sounds jaded, and perhaps it was. But thanks be to God, my being jaded isn’t the point or end of the story. I had a job to do; I had to go, take photos, and collect the people’s reaction for an article for the WYD press office. So, I faced the sunshine and crowds and walked with an Englishman, a Guatemalan and a Spaniard to the place where the pope would change from his black transport car to his Panamanian-made pope mobile. As soon as the pope’s motorcade came into view, the crowd erupted. I had forgotten what energetic, joyful anticipation felt like. We were covered with goosebumps despite the heat. We stood on tip-toe despite the foot cramps. And we cheered like we’d just discovered we had voices. In that moment, I was reminded why seeing the pope matters. He, as the successor to Peter, reminds us of the need and promise of our salvation; he reminds us that Christ is present among us, that he is accessible, that he is our friend. So, I’ll make an amendment to my original statement: I wasn’t excited to see Pope Francis — until I did. And that experience during the opening of WYD set the tone for the rest of the week. I let myself be imbued with the joy of the thousands of young Catholics around me. Every other time that week I ran to see the pope. I woke up at 3:30 a.m. to catch a bus to participate in Mass with Pope Francis. I stood with friends for five hours to say thank you to the pope during his meeting with the WYD volunteers. I lived WYD and have come back to Kansas renewed.